Remco: What kind of food or flavors go best with Brekle’s Brown? 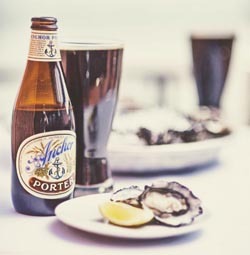 Anchor Porter and fresh oysters? You bet. Bob: When pairing food and beer, the standard thinking is to either match intensities, complement one another, or offer an interesting contrast. IPA with sharp cheese, porter with robust meats or BBQ, wheat beer or pilsner with lighter fare – these are examples of matched intensities. The fun part of this is that the same beer can often be used to different ends. Anchor Porter with oysters, as well as with BBQ, for one. Anchor Steam with seafood, as well as with seasoned poultry, is another.